Of all the threats to pregnant women — chemicals, litter boxes, hot tubs and more — Sandpoint woman Jessica Rachels didn’t know she was putting her unborn baby at risk simply by doing her job as a mother and child care provider. Rachels was pregnant with her second child while raising a preschooler and working in child care both at home and at a daycare center. She believes her profession is why she contracted cytomegalovirus, or CMV, a virus of the herpes family that can infiltrate the placenta and cause a variety of disabilities in unborn children. CMV is spread through contact with the bodily fluids of an infected person, and it’s most often contracted from small children. 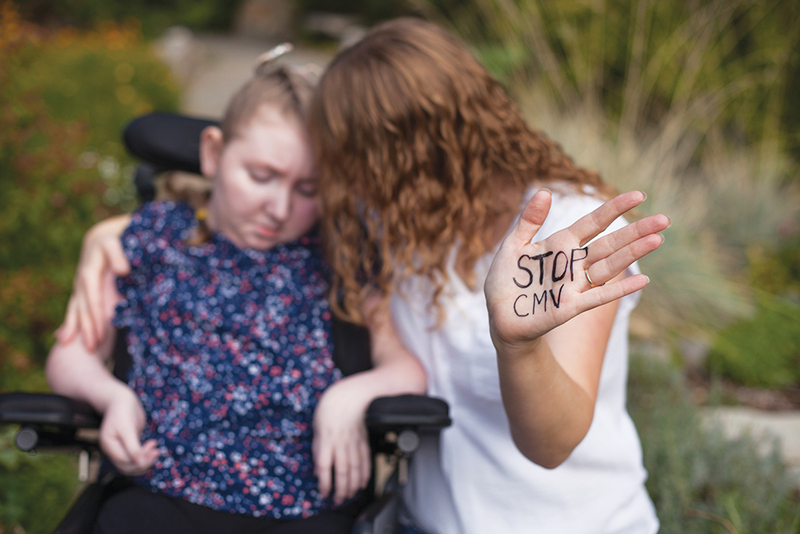 Rachels began to educate herself on the issue, leading her to find that the Centers for Disease Control reports a one-in-200 chance that a baby will be born with congenital CMV, and one in five of those children will experience defects for the rest of their lives. “That’s not a fluke,” Rachels said. She and her husband attended conferences where the commonness of CMV became more and more clear, she said. Helping other mothers be informed is now Rachels’ mission. She and several other mothers of CMV children in Idaho have started the Idaho CMV Advocacy Project, and they’ve already made change on the state level. In March 2017, Idaho passed a law allocating $15,000 to the Idaho Department of Health and Welfare for the creation and distribution of CMV awareness materials. Those materials are then distributed to doctors, childcare programs and other places new moms might go. June is also Idaho CMV awareness month. That education mostly pertains to hygiene, Rachels said. Hand washing is huge for pregnant women, especially around children after handling toys, wiping noses or changing diapers. Advocates also advise against sharing food, drinks and utensils with children, kissing children on the lips or putting pacifiers in your mouth. Rachels said her now pre-teen daughter operates at the level of the six-month-old baby due to the effects of CMV. She said she is an expressive, happy girl who loves peek-a-boo and her family. But at the end of the day, her severe disabilities seriously hinder her quality of life. Natalie has cerebral palsy, has had 12 surgeries on various parts of her body, uses a feeding tube and is visually and hearing impaired, just to name a few of her struggles. Rachels said the Idaho CMV Advocacy Project will continue to work toward more legislation to combat CMV, like targeted testing for babies who fail the initial newborn hearing screening. If detected early, babies at risk for permanent CMV disabilities can be treated.